Photograph of the field at Antietam, American Civil War. 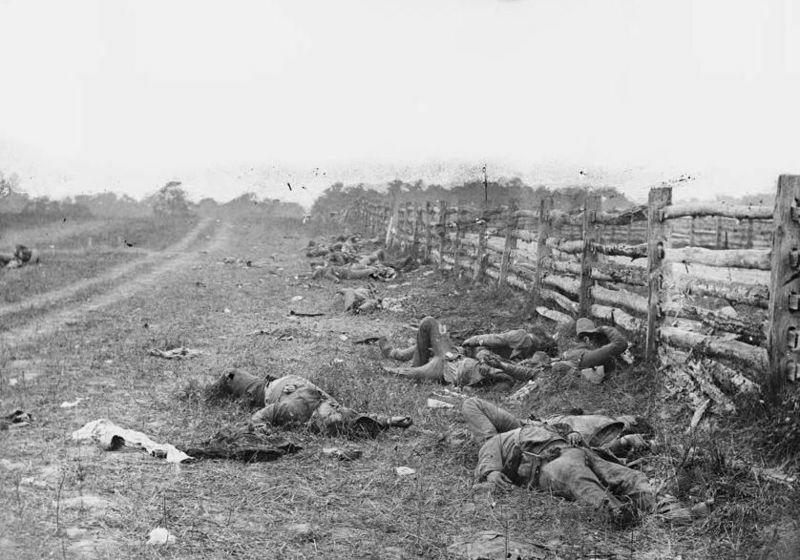 Confederate dead by a fence at the Hagerstown Turnpike, looking north; the Turnpike is to the right of the fence, the dirt lane on the left leads to the farm of David Miller. fear and confusion settle on the streets. marrow from the bone, while the ground shakes. finished.” Because it was. Finished. that broke in two in the blind crushing, in the love. bitterest gall of the darkest evil. will fail us, will bring us down, will end us. wars against the day to darken and deafen our nation dumb. our own sins first, America. We need more blood, not less. Amnesiac drop. More blood, not less. Such a powerful truth, concisely stated. I sincerely believe in Ps 133, that unity is a blessing. But we will not be able to unify around a tragedy for very long, only around the greatest tragedy of all time –the crufixion. The cosmic cruciform of history and eternity’s lines cross and carve into our consciences.